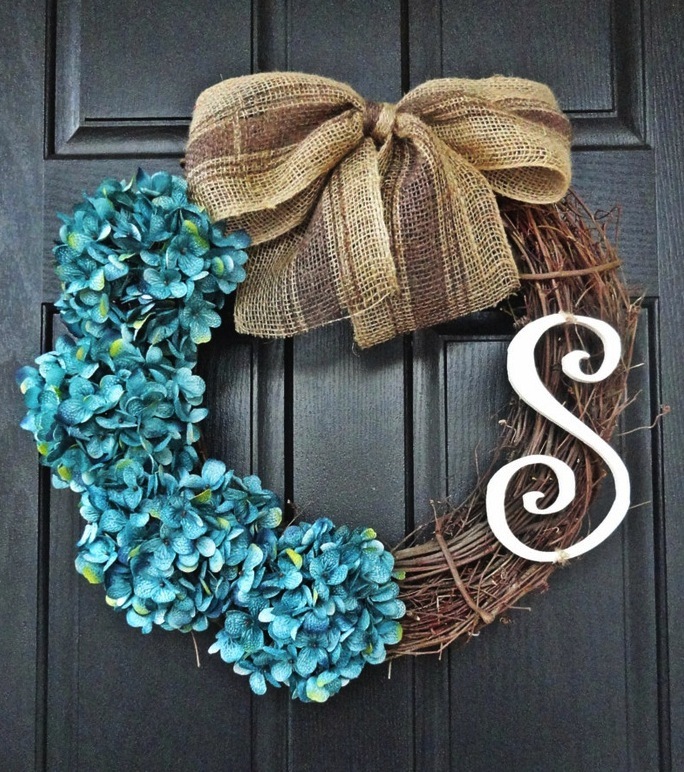 Since we moved into our apartment, I have been itching to make a summer wreath for our front door. Since we were in a high rise in Hoboken, I didn't do wreaths except for Christmas so I am excited to have one on our door now. I think it makes a home feel so much more welcoming. 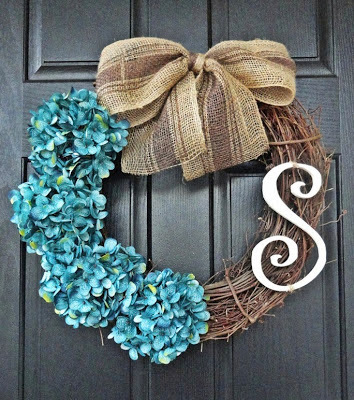 I had seen a couple monogrammed hydrangea wreaths on Pinterest that I just loved. I've been totally obsessed with hydrangeas since our wedding. I picked up the supplies I needed from Michaels and the flowers were 50% off. Between Hobby Lobby, Michael's and A.C. Moore, you can pretty much guarantee silk florals will be on sale at any given moment so never pay full price for those. 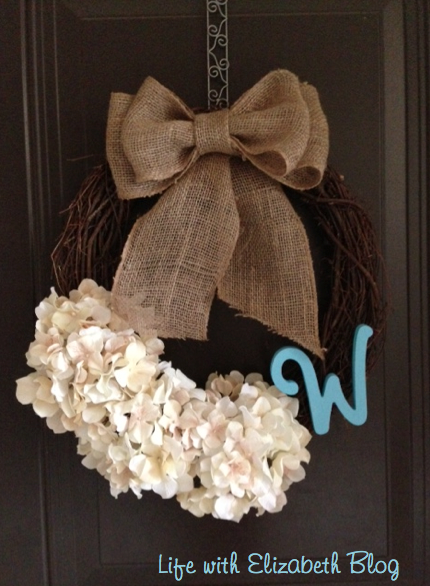 I bought 3 hydrangea blooms for my wreath, a grapevine wreath, a roll of burlap ribbon, and a wooden letter W. Then, the first thing I did when I got home was paint my W so it would be dry when I was ready to craft. Start with your wreath laying flat. I did mine on the carpet with a glass of wine catching up on all my DVR'd shows. 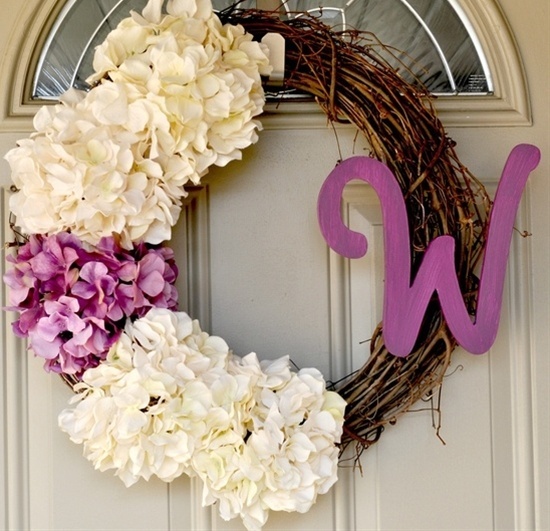 Use a hot glue gun to attach your hydrangeas. Make sure to lay them out first so you know where you want to place them. My mom (who is an awesome wreath maker) would probably suggest using floral wire to wire them to the wreath but hot glue worked for me. Attach your monogram letter with hot glue. Don't be shy when using the glue. More is better here so nothing falls off on a windy day. Next, I fashioned a bow out of burlap and glued it to my wreath. This is the only style bow I know how to make. My mom can freehandedly make bowdabra style bows and they look gorgeous. One day I'll have to learn that. If we need a bow making tutorial, I can do that next time. This one is pretty easy to make. Then, hang it on your door and admire every time you come and go. I love it! Gotta make me one now :) I would also love to know how you tied that bow. I am awful at tying bows (another reason why I wear heels). Love it! 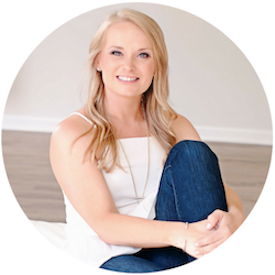 Would also love a bow tutorial! Really cute! Easy projects like that one are the best! And I love your hot glue gun! Gorgeous! Could you please do a bow tutorial?